1. Keep a Gratitude Journal. Establish a daily practice in which you remind yourself of the gifts, grace, benefits, and good things you enjoy. Setting aside time on a daily basis to recall moments of gratitude associated with ordinary events, your personal attributes, or valued people in your life gives you the potential to interweave a sustainable life theme of gratefulness. 3. Practice Calming Your Mind Through Meditation. Click on the link below for further guidance on meditation..
4. Prayers of Gratitude. In many spiritual traditions, prayers of gratitude are considered to be the most powerful form of prayer, because through these prayers people recognize the ultimate source of all they are and all they will ever be. 6. Use Visual Reminders. Because the two primary obstacles to gratefulness are forgetfulness and a lack of mindful awareness, visual reminders can serve as cues to trigger thoughts of gratitude. Often times, the best visual reminders are other people. 7. Make a Vow to Practice Gratitude. Research shows that making an oath to perform a behaviour increases the likelihood that the action will be executed. Therefore, write your own gratitude vow, which could be as simple as “I vow to count my blessings each day,” and post it somewhere where you will be reminded of it every day. Do you find gratitude difficult? 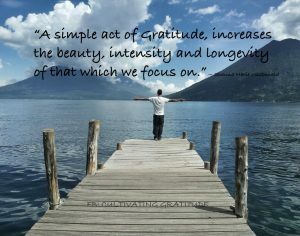 Is gratitude part of your daily or weekly experience? Do you find some people impossible to feel gratitude towards?